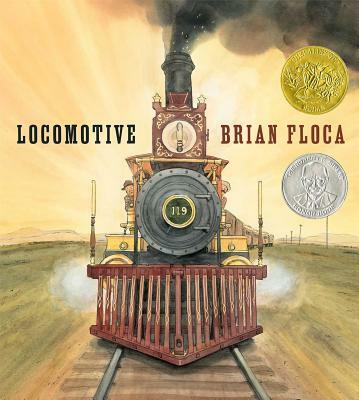 * "Floca took readers to the moon with the Apollo 11 mission in Moonshot (2009); now he takes them across the country on an equally historic journey of 100 years earlier. In a collegial direct address, he invites readers to join a family—mother, daughter and son—on one of the first passenger trips from Omaha to Sacramento after the meeting of the Union Pacific and the Central Pacific in May 1869. With encyclopedic enthusiasm, Floca visually documents the trip, vignettes illustrating the train’s equipment as well as such must-know details as toilet and sleeping conditions. Full- and double-page spreads take advantage of the book’s unusually large trim for breathtaking long shots of the American landscape and thrilling perspectives of the muscular engine itself.... Unjustly undersung as a writer, Floca soars with his free-verse narrative, exploiting alliteration, assonance and internal rhyme to reinforce the rhythms of the journey. Frequent variations in font and type (“HUFF HUFF HUFF!” is spelled out in ornate, antique letters) further boost the excitement. Front endpapers provide detail on the building of the transcontinental railroad; back endpapers show the steam engine in cross section, explaining exactly how coal and water made it go. Nothing short of spectacular, just like the journey it describes." Talk about a youth librarian’s dream come true: a big new book about those ever-popular trains from a bona fide picture-book-nonfiction all-star. Striking cinematic endpapers lay the groundwork, describing the creation of the Transcontinental Railroad in the 1860s. Then, in a sort of historical-fiction-meets-travelogue narrative, Floca zeroes in on one family’s journey from Omaha to San Francisco. Floca excels at juxtaposing sweeping panoramas with intimate, slice-of-life moments: here a widescreen shot of the train chugging across the Great Plains; later a vignette at a “dollar for dinner” hash house (“If the chicken tastes like prairie dog, don’t ask why,” cautions the narrator). Varied font sizes and styles on the large pages beautifully capture the onomatopoeia (“Hisssssssss”; “huff huff huff”; “chug-chug chug-chug chug-chug”) of the train and the feel of the Old West. One spread finds the train precariously crossing a trestle (“The train is so heavy, the bridge is so narrow, and rickety rickety rickety!”); the concluding ricketys are displayed in an appropriately jarring shadowed font alongside a picture of passengers shaking—and praying—in their seats. Luckily, our family makes it safely to its destination: “the country’s far corners have been pulled together…thanks to the locomotive.” An author’s note and thorough discussion of the sources used are included, and don’t miss the back endpapers—the steam power diagram would make David Macaulay proud."